Requires only weekly rotation. End air vents create essential ventilation. Can be rolled to any location for filling or dispensing. Wheeled base makes turning effortless. Holds up to 89 7/9 gallon of compost. Black color absorbs heat for fast composting. In the world of composters, you have two basic choices: Bins and Tumblers. Compost bins typically hold more than compost tumblers but must be aerated constantly. Tumblers aerate easily but usually don’t hold as much material. 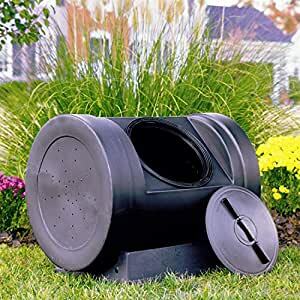 This 89 Gallon Tumbling Compost Bin Composting Tumbler Composter resolves both of these shortcomings. Its massive drum is one of the largest on the market. Handholds allow you to get a grip to optimize your torque, unlike complex, crank-driven systems that are clunky and break over time. The low profile keeps it from blowing over in high winds, helps keep it out of sight, and makes it convenient for loading and unloading material. A common problem with all composters is that you must transport material across the yard which can be heavy. The drum can be leveraged off of the base and rolled to your desired location: No heavy lifting! And the 16” twist lid makes access very easy while also sealing in precious compost tea and keeping out animals. Fresh compost can be made in just 14 days and you only have to turn it once a week or after the addition of new material. And to make things easier, it comes completely installed so you can start composting immediately.